India will play 5 ODIs and 3 T20Is in Australia. We will bring you previews, predictions & betting tips for all matches. The attacking squad of India demolished Australia in the consecutive T20, sealed the 3 match series at 2-0 and anticipates a whitewash after the coming game. After getting stick in the ODIs, India came back strongly by winning the first T20 vs. Australia and anticipates same results in the remaining two games. 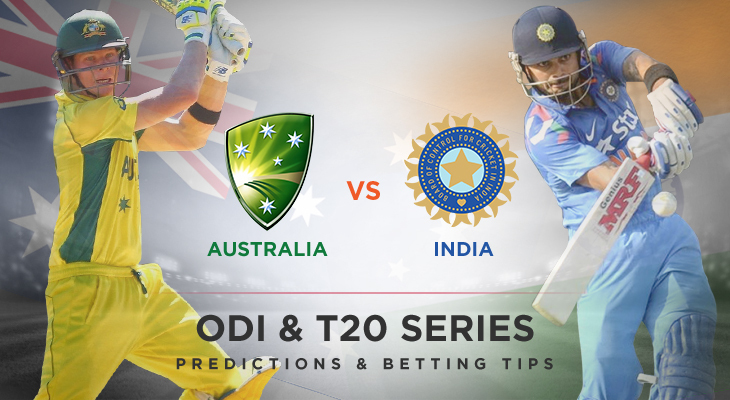 Australia won the five match ODI series vs. India at 4-1 and will anticipate same results in three T20s as the latter will try to maintain its previous record. Australia kept on crushing India with their 4th consecutive victory and they are not far away from a whitewash as the latter will fight hard in the final game. Australia conquered the 3rd ODI, clinched the five match series against India in another fighting encounter and look forward to maintain their rhythm onward. Australia kept on bulldozing India by clinching the 2nd consecutive match and is just one game away from winning the series while the latter has to work hard. A superb knock of 171 from Rohit Sharma went in vain as Australia won the 1st ODI vs. India, anticipates identical result in the 2nd as the latter can hit back. Team India has started their recent tour of Australia where they will take part in 5 ODIs along with 3 T20s and the tour will commence on January 12, 2016.